A CLUB’S AMENITY MIX makes a difference. Clubs with expanded offerings command higher initiation fees and attract more members. 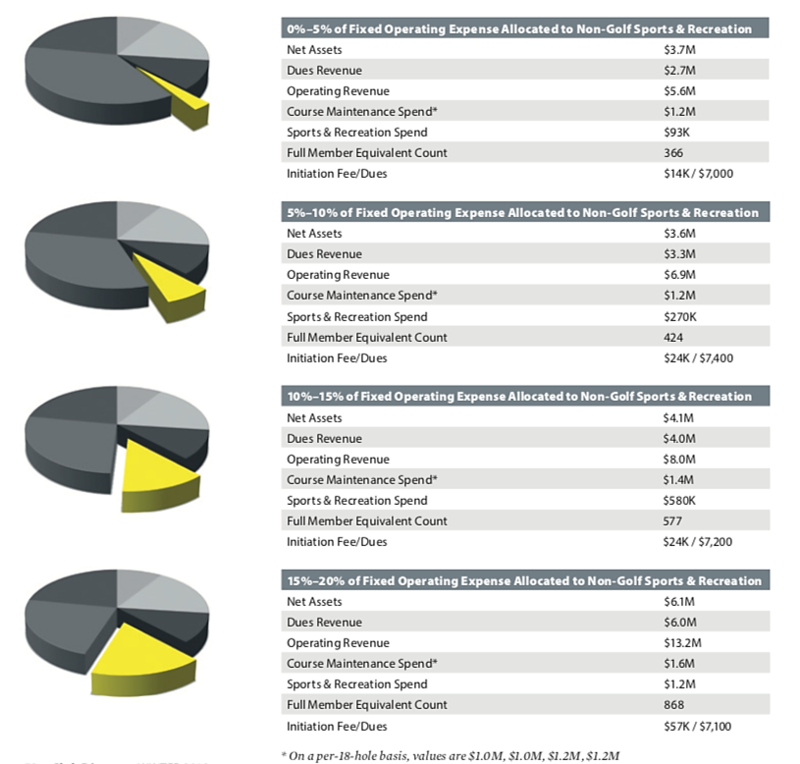 The yellow slice in the pie charts below represent the percentage of fixed operating expense allocated to non-golf sports and recreation (i.e., racquet sports, fitness, aquatics). CLUB BENCHMARKING DATA REVEALS a “Tale of Three Cities” happening in the club industry, and we are deeply concerned about what appears to be a growing divergence. According to our research, one-third of clubs are prospering and growing, one-third are “going sideways” and one-third are falling further behind every year. The metric we use to measure prosperity and growth is the compounded annual growth rate (CAGR) in net worth over time, aka Members’ Equity or Unrestricted Net Assets. investing to deliver a compelling member experience. The Club Benchmarking research team has analyzed net worth over time (2006 thru 2018) for more than 300 clubs. Thirty- five percent of those clubs have seen their net worth decline in absolute terms (worth less today than in 2006). Currently, the median CAGR for this group of clubs is 2.1 percent, which is below the inflation rate for construction during that same period. Only 37 percent have CAGR at or above 3.5 percent— Club Benchmarking’s recommended target. For contrast, the upper quartile representing the healthiest clubs, has a growth rate of 5% or more. In our club industry version of Dickens’s classic tale, the difference between the “haves and have nots” comes down to mindset. The prosperous clubs are focused on programming and investing to deliver a compelling member experience. They reap the benefits of that focus through increased capital contributions from their existing members and from new members paying healthy, consistently increasing initiation fees. Our data proves clubs that have invested consistently over the last 10 years are experiencing a corresponding, quantifiable increase in members equity (net worth) over time, whereas clubs that have restricted their capital investments are seeing the opposite effect. Medical advancements like joint replacement have made it remarkably easy for aging club members to rebuild their crumbling physical infrastructure with the installation of a brand-new hip, knee or shoulder. We all have a friend or golf partner who’s gone through it, but probably none who would have ever considered performing their own surgery or even worse, asking a member of their regular Saturday foursome to take up a scalpel. There’s no debating that the best person for such a serious job is an experienced medical professional. Preferably one who is properly trained in their field of expertise, armed with a track record of successful outcomes and proper tools for the task at hand. There are just some situations where a do-it-yourself approach should never be considered an option. depiction of the club’s future capital needs. According to Club Benchmarking data, more than 60 percent of private clubs in the United States are currently underfunded for future capital expenditures. For many clubs, the gap exists because they lack accurate documentation of the scope, condition and life expectancy of their club’s physical assets. 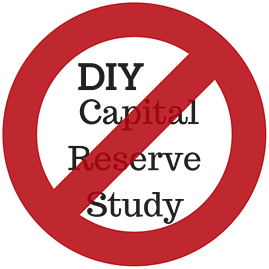 The alternative to this risky and inefficient DIY approach is an objective, third-party, professional capital reserve study (CRS) to inventory, assess and prioritize capital needs well into the future. A professional CRS provides the financial starting point for strategic planning and is a critical component of fulfilling a board’s fiduciary responsibility. 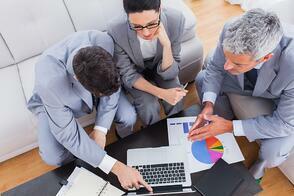 Instill member confidence in financial plans and projections. Our proven process of financial analysis, staff interviews and onsite inspections creates a foundation for impartial, fact-based decisions and serves as the critical input for long-term financial planning. Satisfaction vs Loyalty: What's the Difference? Member satisfaction and member loyalty are related, but the terms are not interchangeable. Ask yourself this question… Are your club’s most loyal members always satisfied? Probably not. Loyal members are often the first to offer constructive criticism when an amenity or service misses the mark. They may not be satisfied, but their strong desire to help the club improve is a manifestation of their loyalty. On the other hand, satisfied members are not necessarily loyal members. Members exhibit loyalty when they recruit others to join the club, maintain their own memberships year after year and speak positively about the club in the community. The two constructs are very different, with loyalty outweighing satisfaction in long-term benefit to the club. The bond that links them together is “attachment.” Our published research on Predicting Member Loyalty confirms that members with a low degree of attachment to the club are likely to resign, while highly attached members are likely to renew for another year. Attachment is defined in psychology as a strong bond between an infant and a caregiver. Marketing researchers began to study attachment because it had a direct impact on a consumer’s commitment to a brand. This research discovered and described a specific type of attachment called “place attachment,” which refers to the relationship between people and a particular place. In clubs, place attachment plays a major role in member loyalty. Place attachment, in the context of a private club, functions as the bridge between member satisfaction and member loyalty. Satisfaction influences attachment which in turn influences loyalty. Clubs create loyal members when a personal attachment is developed through the club’s culture and offerings. Place attachment has four components: 1) Place dependence measured through the member’s connection to the club’s amenities. 2) Place identity measured by how closely a member's personal values align with the club’s values. 3) Social bonding describes the connection with other members, with club staff, and with family members using the club as a host for these relationships. 4) Place affect describes the feeling of belonging to the club and the emotional affect it bestows upon the members. Golf Course Maintenance:How Much Should You Spend? The industry debate over how much a club should budget to maintain its golf course seems never-ending, and that’s understandable. The course consumes a significant portion of the cash required to run a club and it is also one of the most visible and member-impacting amenities, so a high degree of focus is justified. As a start, let’s consider the following scenario: While the median club in the country spends close to $1.2M on course maintenance, two clubs within a few miles of each other spend $700K and $1.75M respectively on their 18-hole courses. We all know, and have probably played at, clubs on both ends of this spectrum. Since we began working in the club industry in 2010, we’ve had the opportunity to interact with leaders of hundreds of clubs across the country. 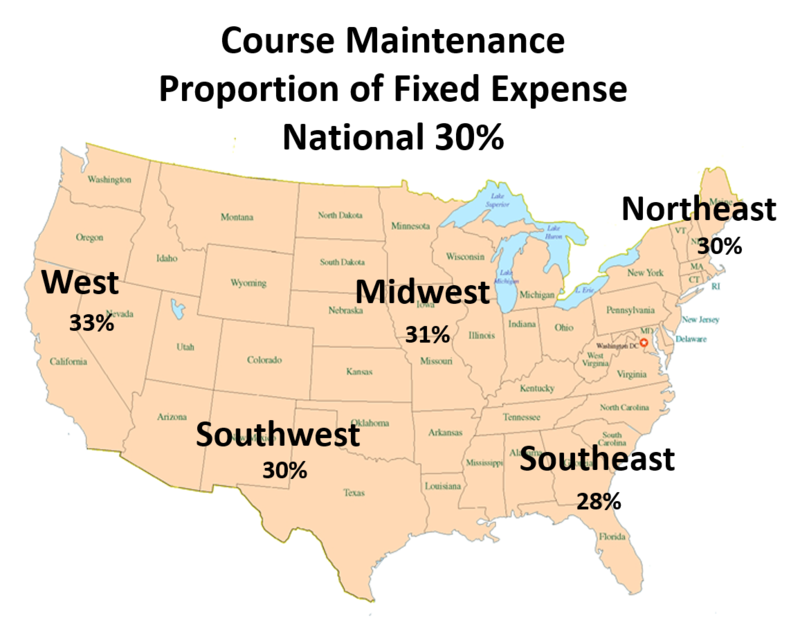 Typically, the discussions we hear about course maintenance budgets involve benchmarks such as cost per hole or cost per acre and a variety of specific characteristics ranging from type of grass to geographic location. To understand the way in which these factors might be used determine how much money a club spends on course maintenance, we undertook extensive analysis of club industry data, studying clubs that range in annual revenue from $1M to $40M, exist in nearly every state in the country, have nine through 108 holes, grow every type of grass and see variation of seasonality, weather conditions and rainfall. 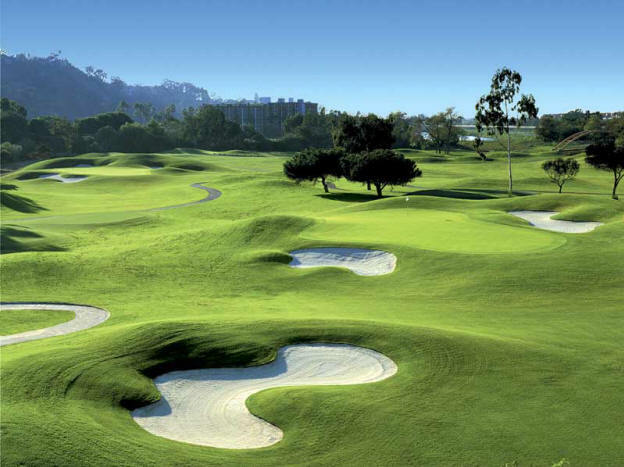 The data revealed that while traditional benchmarks (cost per hole, cost per acre, cost per member, type of grass or geographic location) may represent the actual spending of an individual club, the simple fact that the club up the road is spending more on their course than you are is not enough to justify a decision to beef up the budget. So, how much should you be spending? Contrary to conventional wisdom, our research clearly shows that the answer is ultimately not determined by some combination of physical characteristics. The reality is that clubs spend what they can afford to spend. Before you dismiss this idea as random or arbitrary, consider this: The amount a club can afford to spend is eminently quantifiable and can be easily and accurately benchmarked. The proportionality of spending in clubs is highly consistent and represents the foundation of the common club business model. 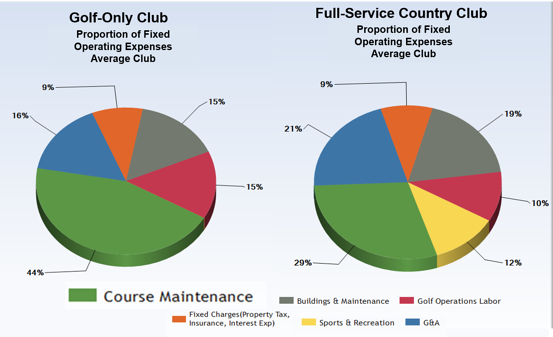 See the pie chart below for the proportionate distribution of gross profit (the money a club has for funding fixed operating expenses) including the portion spent on course maintenance, across all clubs. It is important to note that the proportions shown, +/- a few percentage points, are consistent across the entire industry, independent of club size (based on total operating revenue) or geographic location.The business model of clubs, as defined by data from the industry itself, defines these proportions as the benchmark. So roughly one-third of a club’s gross profit (don’t think revenue) is the affordability at the average club. We also studied the range of club types among those with golf— from pure golf clubs to full-service country clubs with more diverse amenity sets. What we discovered is that for a diverse club, like the one on the right in the chart below, the combination of course maintenance spending and other sports/recreation spending uses about 40 percent of a club's gross profit. 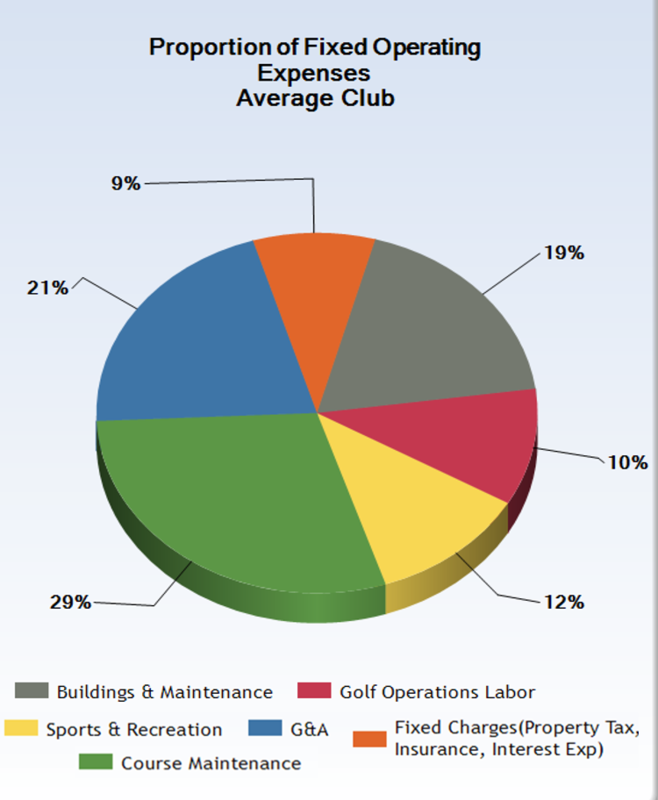 With no other sports amenities to fund, a club with only golf like the one on the left in the chart below, typically spends a little more on course maintenance—around 40 percent of its gross profit. That pattern has proven to be consistent across the industry. Going back to the range of course maintenance spending referenced at the beginning of this article (from $700K to $1.75M), would you conclude that one club is spending $1M too much or that the other spent $1M too little? Of course not. We know each course can be beautiful and a pleasure for its members. In fact, those examples are from real clubs located just a few miles from each other. They are spending 32 percent and 34 percent of their gross profit respectively on their course—nearly identical spending from the business model and affordability perspective. Any of the traditional measures, cost per hole, cost per acre, geographic location, etc., would have led to a very different, and incorrect, conclusion. The broad value of this model is further realized when one understands that it doesn’t matter whether a club has 18, 36 or more holes. The affordability, a.k.a. the proportionate spending on course maintenance, doesn’t vary based on hole count, number of acres, type of grass, etc. As supported by industry-wide data, the only driver of a club’s course maintenance budget is affordability. Clubs spend what they can afford! On the margin, there is naturally some variation. Golf-only clubs, with less competition for cash resources going to other amenities tend to spend a higher proportion of their gross profit (into the low 40 percent range) on their course, while very large clubs, or clubs with significant non-golf sports facilities tend to spend in the high 20 percent range. The national median is 30 percent of gross profit going to course maintenance. The split between course spending and non-golf sports spending is actually an indicator of the "golf club vs. family club" strategy of the club. Geographically, there is variation on the margin, but only a few percentage points from the national median, as per the data map below. So, what does all this mean? We now know that individual data points, without the context of the bigger picture, can be misleading and are not an appropriate source of guidance and support in the decision-making process. Next time you’re in one of these discussions, remember that your club, like all clubs, is subject to the common industry business model and your budget is driven by your gross profit. Having a clear understanding of what has been revealed by the study of industry data will help you have strategic fact-based discussions about your own course maintenance budget. What are our future capital needs? What are our projected capital resources? Capital planning is at once the biggest challenge and the best opportunity for improvement in clubs, and yet few clubs seem to fully recognize its importance. 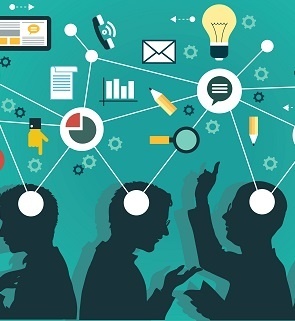 There are two easily calculated measures that managers and boards can use to gain keen and immediate insight into their club’s capital situation: Net Worth (owner’s equity in a for-profit club and unrestricted net assets (UNA) in a not-for-profit club) and the Net Available Capital to Operating Revenue Ratio. Understanding the club’s Net Worth over time begins by assembling ten years of audited financial statements. Search the documents for “Owner’s Equity” if you’re a for-profit club or “Unrestricted Net Assets” (UNA) if you’re a not-for-profit club. Enter the number for each of the ten years into a spreadsheet and plot a simple line graph using that data. 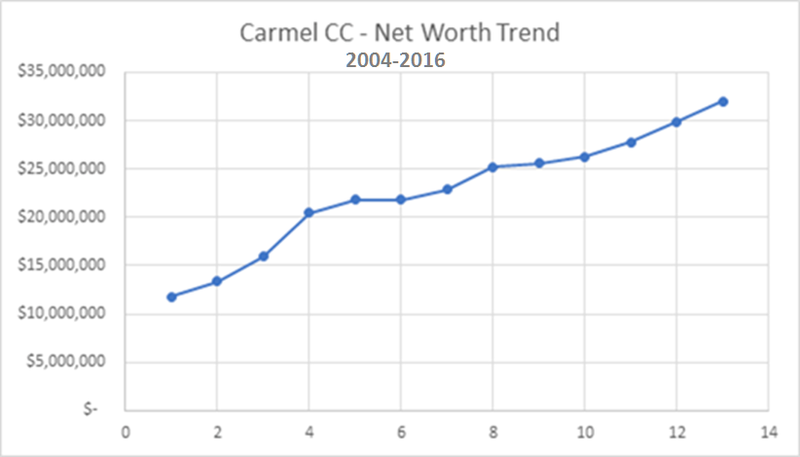 The resulting graph shows your club’s net worth over time and clearly illustrates whether your UNA is increasing, going sideways or declining. 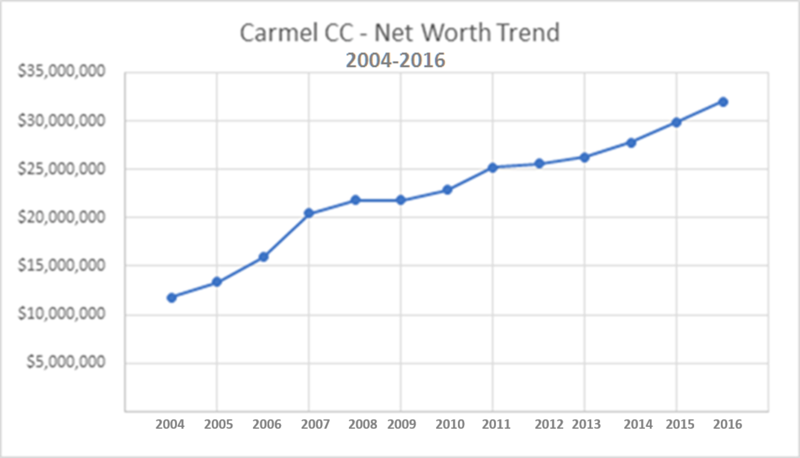 The chart below shows a real-life example of UNA or Net Worth over time, plotted in this case by Carmel Country Club in North Carolina. The club’s impressive growth, from a net worth of about $12 million in 2004 to more than $30 million in 2016, is a direct result of a strong commitment to capital investment on the part of club’s Board and Management. 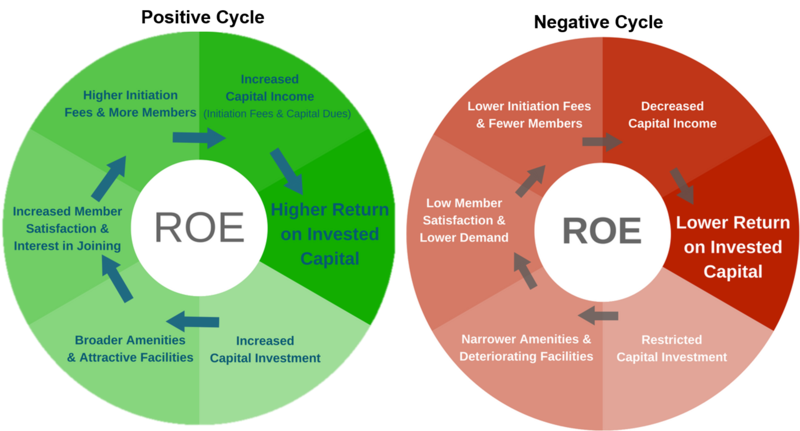 The club’s consistent cycle of investment has, over time, produced amenities that increase the value of being a member of the club. Strengthening the club’s value proposition supports increases in initiation fees and dues and as a result, the club’s UNA is on a very healthy upward trajectory.. The second exercise, calculating your Net Available Capital to Operating Revenue Ratio, draws on the financial statements you gathered to study Net Worth. Using data from the financial statements, calculate your club’s earnings before income taxes, depreciation and amortization (but after covering expense of interest on debt). The result of that calculation is called Net Available Capital. It is the money remaining at the end of each year that can be used to pay down debt, make capital investment or put money in the bank. Analysis of industry data shows that at a minimum, clubs must generate Net Available Capital equivalent to 12% to 15% of their total operating revenue every year. One quarter of clubs generate 7% or less (capital starved clubs) and at the high end of the spectrum, a quarter of all clubs generate more than 17% (capital rich clubs). Fifty percent of all clubs aren’t generating the necessary capital over time. 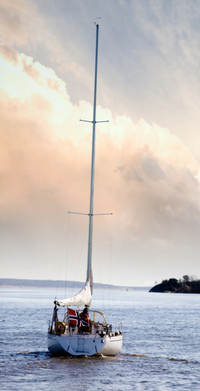 If your club’s Net Available Capital is below 12% and especially if you are in the sub 10% range, you are very likely feeling the stress of too little capital – you may even see the evidence when you look at your physical assets. Those two quick, but critical, ratios will yield great insight. Now let’s address how to use the ratios as a catalyst for constructing a plan. There are three key points related to capital planning and aligning a Board and membership on this important issue. Industry data shows that clubs investing continuously over time have a higher rate of return on equity than clubs restricting investment. Capital investment is a momentum game, meaning the more you invest, the more money you will generate for further investment, through higher capital income. The less you invest, the less money you will generate because you won’t be attracting members willing to pay a reasonable initiation fee to join the club. During the last financial meltdown, many of the clubs that reduced or eliminated their initiation fee are now capital starved clubs. 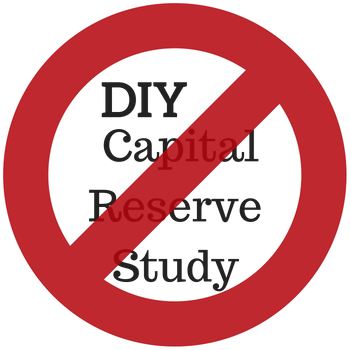 Every club should have a capital reserve study conducted by an objective, 3rd party professional with experience specific to private clubs. We believe a 20-year forward projection is necessary to ensure financial sustainability and consistency in the club's value proposition. The Capital Reserve Study serves as a running projection of your club’s capital needs over time, so you can develop a rational long-term capital investment plan and focus on determining where the resources will come from to meet the needs. Club Benchmarking data shows clubs must focus on a tangible value proposition by continuously investing to create value if they are to succeed over time. If a club is focused only on cost cutting and not the value proposition, the data shows those clubs are likely to get swept into a cycle of decay that will be difficult if not impossible to reverse. The most successful private club executives are in a class of their own when it comes hospitality. They are experts at delivering an extraordinary club experience and managing large teams of people, but we’ve only met a handful that would be comfortable calling themselves experts in accounting or finance. While that’s not surprising since the skillsets are so different, it does present a challenge. In the club boardroom, even strong managers can find themselves at a disadvantage when they come face-to-face with business owners, hedge fund managers, CPAs, private equity managers—people who are extremely well-versed in finance and business. In that scenario an imbalance of power exists, due in large part to the vast difference between the way finance is discussed in the outside business world and the kind of discussions that take place inside the club boardroom. It's a serious communication gap and it leaves many managers struggling to explain the club's results in a way that satisfies the board. 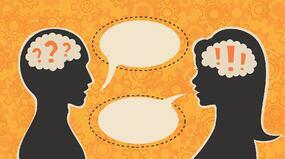 The language of business is finance and it is certainly the native language of your board. 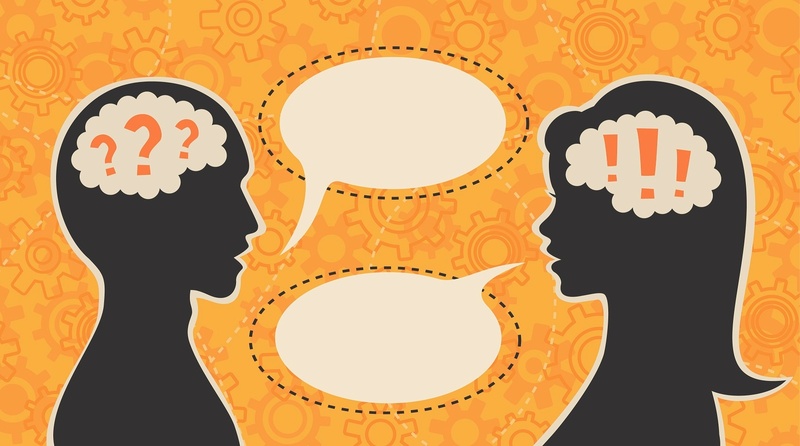 Our goal is to help managers learn to speak the language of finance so they can feel more confident in the boardroom and communicate with their boards more effectively. Business people, like those who populate club boardrooms, understand financial modeling and they know the key performance indicators for their own businesses. 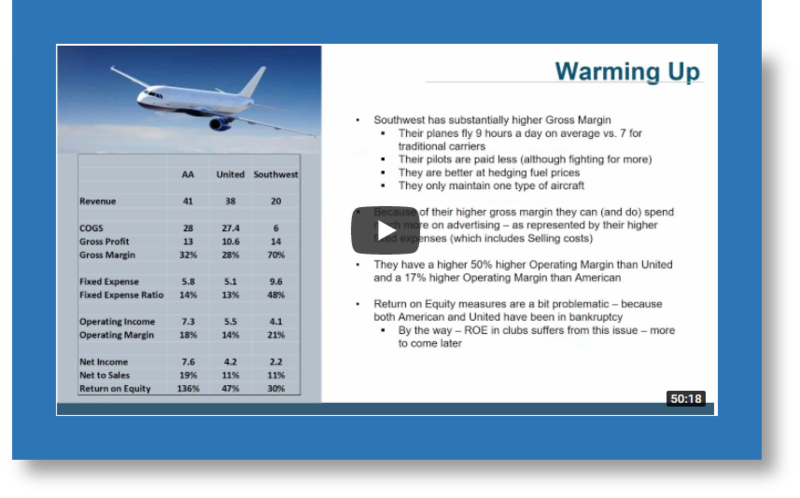 They know their gross margin; they understand their fixed expenses as a proportion of revenue; they understand return on equity. Business owners explain their business using numbers every single day. For private club managers, knowing the club’s numbers, putting them into context and presenting them with confidence is the key to getting the board’s full attention and advancing their understanding of the club business. Every manager has heard those statements. They’re uttered every day in clubs across the country, in the boardroom and by members in the 19th hole. Absent data and context, those statements amount to little more than conjecture and responses like “We need all of these people” or “We have a smaller staff than XYZ Club up the road” are equally unproductive and unsatisfying. Thus, the debate continues. The question boards and managers should be asking (and answering) is this: “Are we staffed at a level that balances the club’s financial results and our member service expectations?” The first step in answering that question and introducing numbers and context to the great payroll debate is to calculate the club’s payroll ratio (total “loaded” payroll as a percentage of total operating revenue). The chart below shows the Payroll Ratio for clubs with golf using club industry data for fiscal year 2015. As you can see, the median Payroll Ratio for this data set is 56 percent. For half the clubs in the set (those between the 25th percentile and the 75th percentile) the Payroll Ratio ranges from 53 percent to 58 percent. It's a small spread but as you can see from the overlay of median operating profit, the impact of a few points is significant. 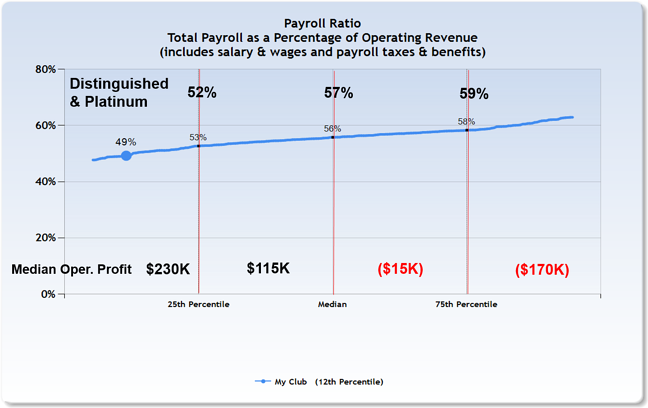 The blue dot in the lower quartile (payroll ratio of 49%) represents a real club – one that was, until recently, stuck in the payroll debate. A small contingent of the membership was actively working to convince others that the club had “too many people” and that those people were being paid too much. Clearly, having the number (payroll ratio) and putting it in the context of hundreds of other clubs via a comparison set is powerful. What the chart confirms is that this club has a payroll ratio lower than 88 percent of the other clubs in this data set. In the example above the number was well below the median, but some clubs may find that their Payroll Ratio is at or above the median. Whatever the case, it’s important to remember that the number itself is not a conclusion but rather a starting point and foundation for a fact-based discussion about financial realities, club culture and choices. As an example, adjusting a higher-than-typical Payroll Ratio back toward the median is ultimately a matter of choices. Are members happy with current service levels? Would they be open to a reduction in staffing levels or service hours? Is the financial impact of the Payroll Ratio such that the board must make difficult decisions regardless of the members’ preferences? Without numbers and context, the payroll debate is bound to continue as a contentious guessing game. Armed with numbers and context, managers are equipped to bridge the divide and discuss the club's business with the board in their native tongue—the language of finance. Guest Author and Club Benchmarking Subscriber As most club managers do, I try to spend our capital dollars in the most prudent way possible. When the idea struck me to obtain a food truck and brand it with our logo, I kind of figured that I was going to get some raised eyebrows along with some direct questioning. Once the interrogation was over, the end result was surprising and very gratifying. Medinah Country Club has three golf courses and two halfway houses. The membership has been clamoring for a new on-course facility for years. The problem was that the best location for this new amenity was in an area far away from the needed utility infrastructure, and the cost for such a small structure was going to be astronomical for the project scope. One day, I was traveling around the club neighborhood and I spotted a food truck parked and in full operation; the light bulb immediately illuminated. Considering that our golf season is only about six to seven months long, coupled with the fact that we have a very busy shooting lodge in the off-season with limited food and beverage (F&B) facilities, and we are currently building racquet facilities and a golf performance center with no F&B facilities, the idea of utilizing a food truck seemed very practical. As luck would have it, I have a good friend who is a F&B manager for a major league baseball team, and when I surveyed the idea with him he told me that it was my lucky day; they had a relatively new food truck that they weren’t using as much as they thought they would and they were eager to sell for a very reasonable price. Game on; now all I had to do is sell the idea to our board of directors. As expected, I was met with resistance, specifically, a sort of knee-jerk reaction along the lines of “Are you sure that is appropriate for our club?” And I get it, this is Medinah Country Club we are talking about, after all! Home of seven national golf tournaments and seven major golf championships; eight, if you count the upcoming BMW Championship in 2019. “Isn't that something for smaller clubs of less renown?” they asked. Halfway House – With a food truck, we benefit by having a seasonal F&B outlet that is used all year round to serve our members for about 8% of the cost of what new “bricks and mortar” would cost. A Unique Wedding Offering – We are very fortunate to have a breathtaking clubhouse (recently we are ranked the sixth in “The 18 Most Iconic Clubhouse in Golf” by golf.com). But today’s brides are looking for that trendy new thing, that special offering that other venues don’t have that makes their wedding unique. Food truck are just that! The “awesome” thing they can share with their guests. Tournaments and Club Events – Our property consists of over 600 acres of land, on which we host events and tournaments that require F&B service. A Food Truck allows us to access almost any location and set them up in a more efficient way. A little extra help from a Food Truck on Labor Day, Memorial Day and Independence Day is a massive help in alleviating the pressure of the small snack bar not built or equipped to handle the massive influx of business. F&B Offerings on Demo Days: Our Demo Days on the Practice Facility benefit from a more festive mood once we pull a Food Truck and the party begins. Brand Ambassador: Limited advertising for private, member owned clubs? No problem, when we do job fairs and park the truck at our recruitment site and display this very visible backdrop. Public Relations & Community Support: Unfortunately, every community is exposed to natural disasters (tornado, fire, etc.) and when these moments do occur here, we’ll take our truck to the area in need to provide goodwill assistance and charitable support of food and water. When the board heard my rationale, they were immediately able to appreciate the benefits. Once we began, the most challenging aspect of bringing it to fruition was obtaining the proper health permits. 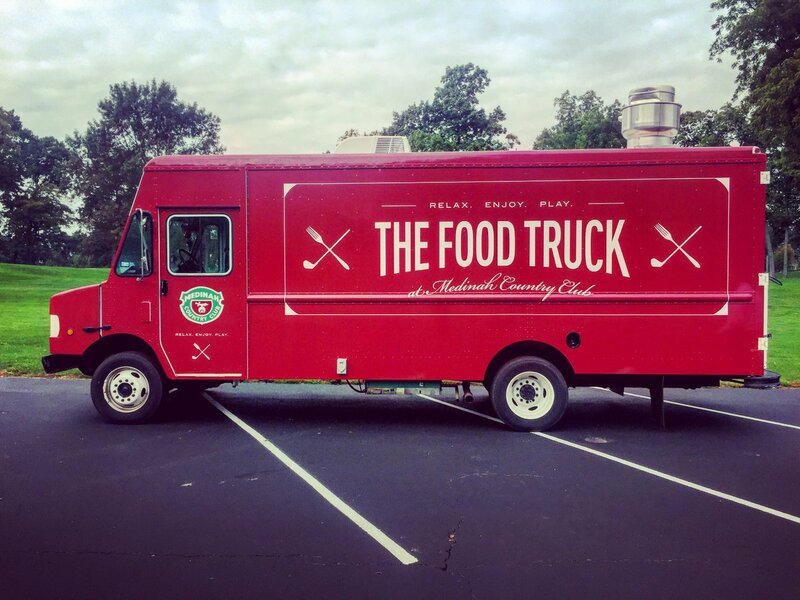 But we are ready to roll now, and even though our first event is still two weeks away, our members are already bragging to their friends outside the club about our new state-of-the-art Food Truck at Medinah Country Club. We haven’t sold one “street taco yet and it’s already yielding benefits. As this enterprise develops, I will keep you posted. The real take-away from this story is not that food trucks are great and every club should obtain one. The moral is that as club managers, our tendency to play it safe causes us to avoid reaching for what is unique, even if there is a strong benefit in doing so. So many times, clubs are interested in “keeping up with the Joneses,” or not taking a chance of doing something different because of how it may be perceived by others, both inside and outside your club community. Your club is what your members want it to be. Yes, we have a food truck… it’s the best darn food truck in the city. If you feel that you have a great idea, then work the plan, present it well, and see what sticks. Don’t be afraid to show your board and your members that your wheels are turning. By the way… did I mention that we have a chicken coop? The private club industry in the United States has been a work in progress for more than 200 years. Clubs are deeply grounded in history and tradition, which may help to explain why the pace of change tends to be slower than in other industries. The evolution of clubs over the last few decades is apparent in areas such as social and culinary trends, but not as easy to recognize on the business side of things, so we turned to a veteran club management professional to get his perspective. As a college student in 1985, Jim Butler took his first club job as a seasonal employee at The Forest Country Club in Fort Myers, FL. Three decades later, he’s moved through the ranks and navigated some significant challenges along the way: golf course and clubhouse renovations, new golf course construction, a transition from developer to member ownership. He currently manages Grey Oaks Country Club in Naples, FL and its two related property associations. In addition to learning the club management ropes from the bottom up, Butler holds an undergraduate degree in chemistry and a MBA in real estate development and finance. Q: Over your 30-year career, what changes have you seen in the world of club management? A: I’d say education and research – those areas have advanced since I started in the club business. Today, the education is available to help managers operate the business enterprise and we understand the business from a holistic point of view as opposed to a silo-view. Q: Your degrees are in chemistry, real estate development and finance. How does that translate to your career in club management? A: I enjoy digging into things to understand how they work and that’s been my approach to the club business. Data and research have always been extremely important to me and that’s particularly true at this club. The leadership, meaning the original owners and my board members, are all very smart, business-oriented people. So are the members. They expect to have fact-based discussions about the club, just as they do in their own business environments. As a manager, I have a vested interest in making sure they get the right kind of data – it needs to be relevant to whatever it is we’re working on. I’ve found that when we incorporate data into the decision-making process, it’s easier to maintain a strategic focus and that moves the club forward. Q: What kind of information is important to you and your board? A: We rely on all kinds of research. We use the club’s internal financial and operational data as well as a variety of regional and national market research and club industry data. That information definitely wasn’t as accessible early in my career as it is now. What has been done in the club industry in terms of research over the last decade or so has really been transformative. Groups like McMahon, RSM, Club Benchmarking, and Global Golf Advisors have all played a role in progressing the industry to catch up with the rest of the business world. Q: In your opinion, what have those groups done to move the industry forward? A: In terms of having an impact, I’d say each group has brought something game-changing to the table. RSM was really the first to do club-on-club analysis by region and club size. They are an audit partner for a lot of clubs in the Florida chapter and their annual trend reports are highly regarded. It’s a comparison on prior year and year-over-year data that we all use and refer to. The Florida chapter considers them an important part of the local industry. McMahon Group has broadened their approach to include lifestyle and strategic management and research is a key component of that effort. They’ve been working with research scientists like Dr. Jim Fisher for more than 20 years. When you can take a scientific data-driven approach to something as critical as a facility improvement plan, that’s powerful. Clubs are able to make informed decisions with the data. 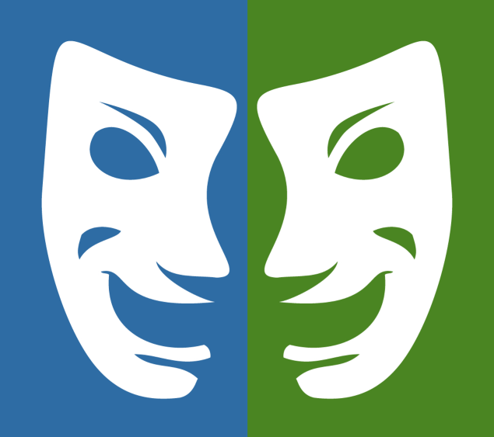 It’s much harder for emotions and politics to get in the way and derail the process. Club Benchmarking has introduced a level of sophistication in the way we think about our clubs by framing a business model for the industry and bringing it to my desktop. I can access the analytics easily and I use them on a daily basis. My board and I can dig in and really study our business now and being able to filter our comparison sets allows us to look at it from a variety of different angles. CB also created a level of education that helps managers who maybe don’t have a background in accounting or finance discuss core concepts with their boards. When a question about something like golf course labor expense can be answered with data, it takes emotion out of the discussion. I know my board appreciates the use of key performance indicators that include standard strategic business terms like gross profit and gross margin. That by itself has been one of the most significant changes I’ve seen. Global Golf Advisors is focused on the industry at a global level and they recognize the need for the private club sector to think outside traditional boundaries. Henry DeLozier is a tremendous advocate for and teacher of strategic management with an emphasis on utilization of data and research. The fact that we’re seeing those concepts taught at the entry level, as young managers start learning about club finance and eventually working toward their certification is certainly a positive shift. Q: Where do you think all of this is headed? A: It’s the private club industry, so maybe change doesn’t always happen as quickly as we’d like it to, but it is happening. We’ve made a lot of progress just in the last decade. Boards and managers are already starting to come together around these business concepts in a way that benefits their clubs and that’s going to improve the overall health and stability of the industry. Every business charts the course for the coming year through the annual budget process, and private clubs are no exception. For many, the experience can be drawn out, difficult and fraught with struggles over tactical items, but we believe we’re seeing a positive change on the horizon as more clubs recognize the need for a strategic, fact-based approach to budgeting. Try to imagine going into the boardroom to present next year’s budget and walking back out, mission accomplished, in under an hour. That’s the inspiration for a story we’d like to share about a club where a shift toward data-driven, strategic decision making has transformed the budget process. For the sake of anonymity, we’ll call it Anytown Club. By industry standards, Anytown is a relatively small club – in the bottom 25 percent in terms of annual operating revenue with less than 300 members. The board is made up of high-powered individuals; a few with names you might recognize, many holding memberships in a dozen or more clubs and all with an equal supply of business acumen and opinions. 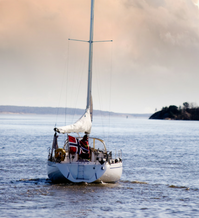 On a small ship, every move makes a ripple and the GM of this club (we’ll call him John) is well aware of how quickly things can veer off course when emotion seeps into the decision-making process. Historically, John would prepare his annual budget and deliver it to the finance committee prefaced by several pages of notes on individual line-items he thought might require additional clarification. The approach is not unusual and clubs using it know the end result can sometimes be budget discussions that digress down into the tactical line-item details. Even though a manager clearly understands the relationship between the budget and the club’s overall strategic objectives, the board doesn't always grasp the same high-level perspective. After joining Club Benchmarking in 2014, John made an important change to his budget process. He replaced the tactical, line-item notes he'd been using with eight or nine charts from his Club Benchmarking Executive Dashboard reports. The charts showed industry norms for high level key performance indicators and the club’s position on each curve was clearly marked. He chose carefully, focusing on strategic ratios like gross margin, dues and capital. The finance committee spent some time studying the charts and asked just a few questions about the source of the data and the anticipated effect of the proposed budget on their current position. Satisfied with what they heard, they signed off. The meeting was over and done in 45 minutes. The following year, James repeated the process with identical results. For John and his club, that one simple change has had a significant impact that goes beyond the sheer beauty of a quick meeting. Bringing data to the table introduced the board to a more strategic perspective on their club. The standard business terminology and measures presented were relevant and meaningful to them and John’s strategic approach to the budget process made it clear that he has a solid grasp on the ongoing health of the business that is their club. Heading into the 2017 fiscal year, there are a number of changes in the mix for Anytown Club, including a dues increase. In a recent conversation John told us that in light of the decisions to be made, the data will be more important than ever, for him and for the board. 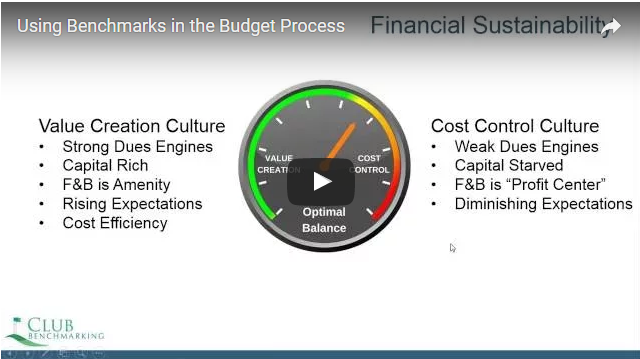 For more on how to use benchmarks in the budget process, watch the video.